For a typical leafy plant, for good growth you keep the soil moist and don’t skimp on the watering. When dealing with succulent plants, different rules apply. Succulent plants store extra water in their leaves, roots or stems to survive long periods of heat and no rainfall. If you are overly generous, they fill up their water storage tissues, become bloated and can actually split open. Soil kept too wet prevents air from reaching the roots, and they die, leading to soft rot. The main cause of potted plant death is overwatering, and this is especially true for succulents. You can usually tell an overwatered succulent by its puffy-looking stems or leaves. The plant can also look generally unhealthy. Reduce the watering and see if the plant responds. When the roots die from too-wet soil, the plant can look like it needs water, with shriveled leaves and no new growth. It does need water, but it has no live roots and can’t take water up. Unpot the plant and check for healthy roots. If the roots are alive and the soil is dry, give the plant water and it should respond. If the roots are dead and the soil is wet, your succulent is in trouble. If rot organisms have invaded the stem of the succulent plant through the roots and mushy areas are present, you can amputate the rot if it is limited in occurrence. Use a sharp knife dipped in alcohol, and excise the rotten tissue until all you see is clean and white. Put the treated plant where it gets bright light and good air circulation, let the wounds heal, then try re-rooting it in well-draining mix. Discard all infected materials, and disinfect the tools and work area. If the plant is mushy inside, discard it and the soil instead of composting them. Prevent overwatering by watching your succulents for growth cycles. When succulents are growing, they thrive on thorough watering alternating with partial drying out of the soil. When they are dormant they don’t use much water and the soil needs to be drier. Most succulents grow in spring and summer, but some grow in winter. The top layers of soil will tell you when your succulent needs water. Put your finger in the pot and feel if the soil 1 to 2 inches down in the pot is dry or moist. Don’t water if you feel moisture. When plants are dormant, dry soil should extend at least halfway down the pot. For spiny plants, use a chopstick or a wooden pencil as a probe, and check the tip for moist soil particles. If you are in doubt, don’t water the plant. Succulents can recover from underwatering, but you can’t take extra water out of the plant. A well-draining soil mix goes a long way to keep from overwatering succulents. 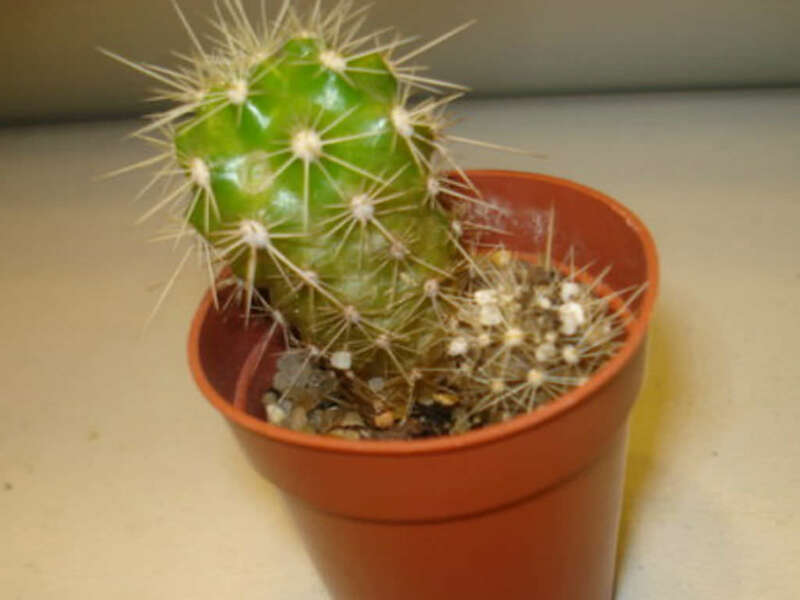 Use a commercial cactus and succulent potting soil mix or make your own, combining equal parts of an organic element such as compost or peat, coarse horticultural-grade sand, and a gritty element such as horticultural pumice, perlite or lava fines. To help the potting mix dry out more quickly, give succulents a pot they can just comfortably fit in plus 1 inch (2.5 cm) of extra space. Repot them yearly as they grow into just the next pot size.